If you’ve never used wyBuild, here’s a quick intro: wyBuild comes in two parts. The first part is wyBuild, obviously, which you use to manage your versions and create your updates. wyBuild is also used to generate the second part, wyUpdate, which is the updater program that you include with your application. wyUpdate is now completely open source. It’s licensed under the BSD license (the most liberal open source license) and the zip file containing the C# sources is available for immediate download. With wyBuild you design the updater client, wyUpdate, by choosing its theme and lanuage. You also manage versions of your software using the tabbed interface. Additionally, wyBuild has two major features that will help small and large software companies alike. The first of which is version management. 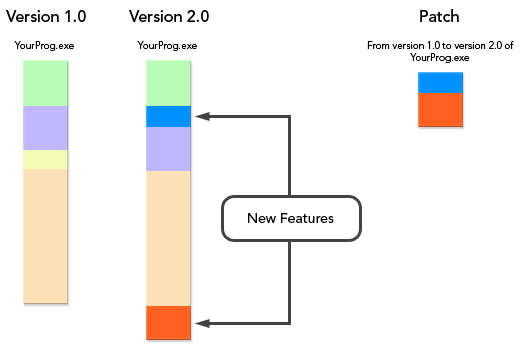 Managing past and future versions of your software is simple. Just drag the files into the wyBuild window. Adding registry modifications is just a simple and intuitive. You won’t even need to visit the help documents or the forum (but they’re there just in case you get stuck). The patches created by wyBuild are much smaller than the zipped files that are used with typical update programs. And much much smaller than releasing a new installer for every update to your program. An example to illustrate my point is Nero Burning ROM. 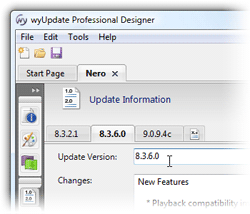 Nero Burning ROM is CD/DVD writing software that has been popular for many years, and Nero is updated frequently. One big problem, though, is their lack of a good update creation and distribution method. 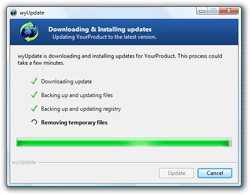 Instead of using an updater program like wyUpdate, they release full installers to their existing users. That’s over 300 megabytes for very small changes to Nero. Why do I have to download 300 megabytes when all I’m using is the main Nero program? And that’s the non-vulgar version of what’s being said about Nero. For every new release of Nero their reputation should go up – not get worse by all the bad buzz surrounding their slow, bloated, distribution system. Ok, ok. You get it. I’m trying to sell wyBuild. Even for all my shameless plugging, a program like wyBuild is necessary to keep your users happy. Our program can create tiny updates that download quickly and install quickly. This saves you money on bandwidth costs all while keeping your users deliriously happy. It’s a free 14-day trial of wyBuild that you can use to release updates to your users right now. If you’re not satisfied, for any reason, within 90 days you get a full refund. No questions asked. We don’t want your money if you’re not incredibly happy.